Stasis means a state of non-movement or balance. That's where I am right now--in stasis. The rush and bustle of the holiday season is over. The Great Plumbing Crisis is resolved and we are postponing repairs for a bit. I have ordered supplies for my March workshops and can't do much else until those arrive. Fibre Week is out of my hands and will unfold as it unfolds. The traffic in my inbox has gone from 2 or 3 dozen emails each day to, well, 2 or 3. Julia and Steve are both in heavy-duty rehearsal schedules for next week's opening of High School Musical at Keyano Theatre, so no meals for the next 2 weeks. The weather is cold and grey and we seem to get just enough snow each and every day to make it inconvenient to go for a walk. I have nothing "important" to do. At first, it was really uncomfortable, not having to multi-task my way through the day. Getting one project or chore finished before moving on to the next. It made me anxious. Something was missing. Or I was missing something. In any event, it seemed very odd. Then it got worse. I felt useless. I got panicky because I was only doing one thing at a time, and most of those things seemed useless and insignificant. I got really restless and irritable. I was going through withdrawal. Then I twisted my knee and had to sit. So I sat. I made a hat. It's a nice hat. The pattern is Gwen's Slouch by Lauren Nell Roy (Ravelry link) and I knit it with the hot, hot pink cashmere that I spun up last month. I held the yarn doubled, cast on on Sunday morning and bound off on Sunday night. And somewhere between the cast on and the bind-off, I realized that I was relaxed. 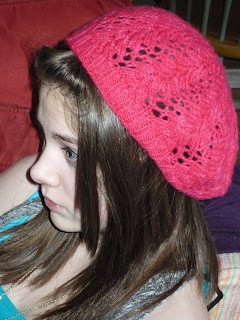 That it was okay to spend a Sunday knitting a hat. That the world did not need me to keep it rotating. I had forgotten how that felt. It feels kinda nice. It's all good now. I can spin and knit and read and get caught up on movies I haven't seen and just sit. I am in stasis. I know I won't stay here for long. Things are going to get ridiculously busy again in about another week or so, and March will be a gong show (I expect to be home for 6 whole days in March!) But it's nice to sit and be comfortable sitting. Or sit and spin. And knit. And just enjoy what I'm doing at the moment.